Ash-Lilly's Lacquer Lust: Fruity Fimo Fingers! It's Thursday friends! I have six weeks before I return to work (arggghhh!!!) and this probably means six more weeks of consistent regular blogging. I guess I'll just have to be extra organised so that I don't fall behind with this. If you see me flagging, please feel free to send me an email chastising me. Yesterday, I received some nail art supplies (that I bought myself) in the post. I got five different types of fimo, a few art brushes, stickers and glitters from here. Shipping was super speedy; I ordered late on New Year's Eve and the goods were posted out on the first working day after the holidays which was 4th January. As I love fruit punch, I decided to make my own and used yellow and apricot because it reminded me of...erm...mangoes. 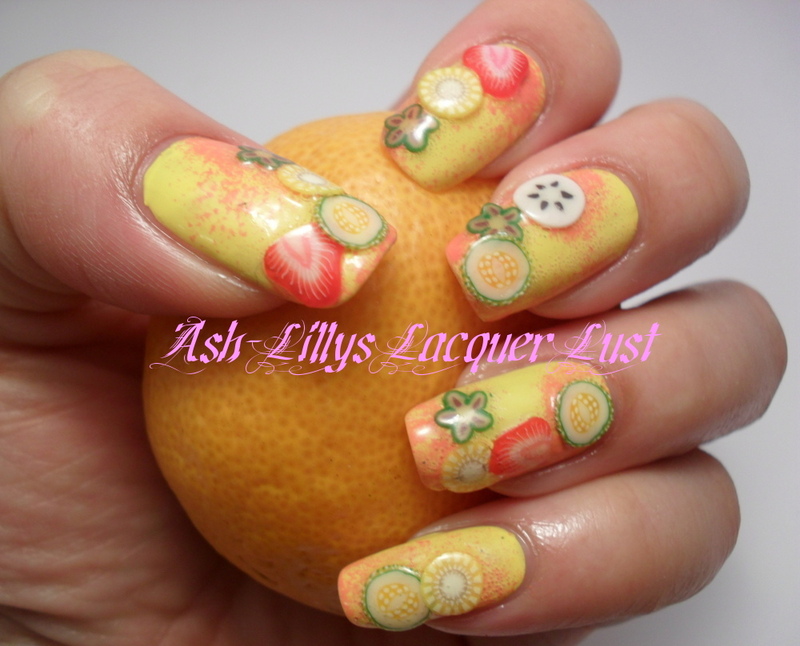 I used Beauty UK's Yellow Peril, Rimmel's Apricot Punch, fruit themed fimo slices, and a sponge for sponging. Two coats of colour over my basecoat...yes, it has bald spots. If I was going to wear this on its own I would've put about three or four layers because pastel/pale colours can be a little streaky in application. 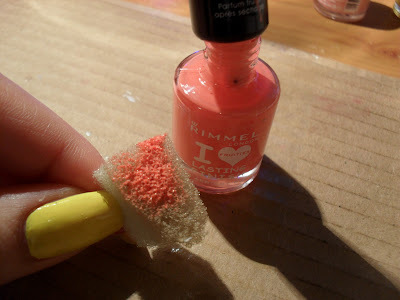 I painted a little Rimmel onto my piece of sponge and dabbed it, in no particular pattern, onto my nails. I then took pieces of fimo and stuck them to my nail with some clear polish. When they were stable, I slathered a coat of the above onto the nail. This polish has been used for the last five months and is now so thick that it is practically like glue, but the fimo was solidly embedded in it. Gotta luv the Sally, maaannn! I should also mention that when I was growing out my acrylic damage, Hard as Wraps was my go-to product. This is a clear nail polish with a thick consistency that is seriously like putting a layer of gel over your own nails. The thickness acts as extra layers of protection over weak nails. If you are in the UK, you can buy this at Boots for around £6-7. Here I am again trying to pose with a piece of fruit. This will definitely get you noticed at the water cooler in your office...but it's probably more attuned to a 'dress-down Friday'! 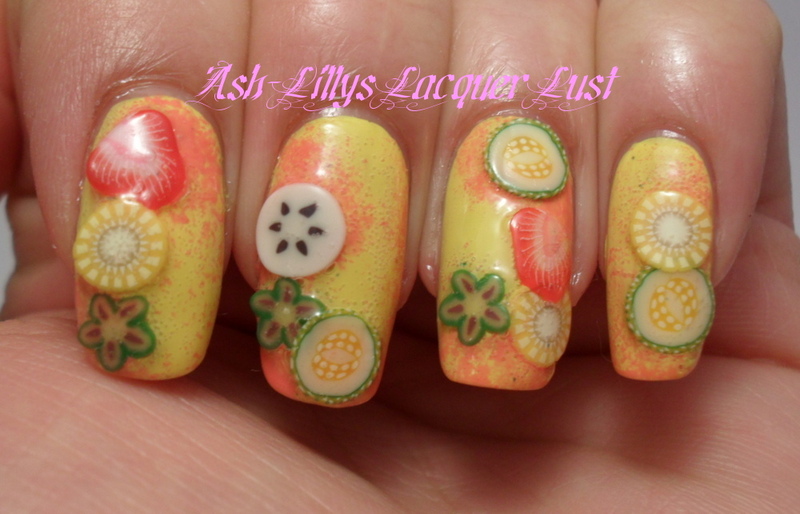 It's fun so if I go on holiday this year, I might do it again but use nail glue to attach the fimo. 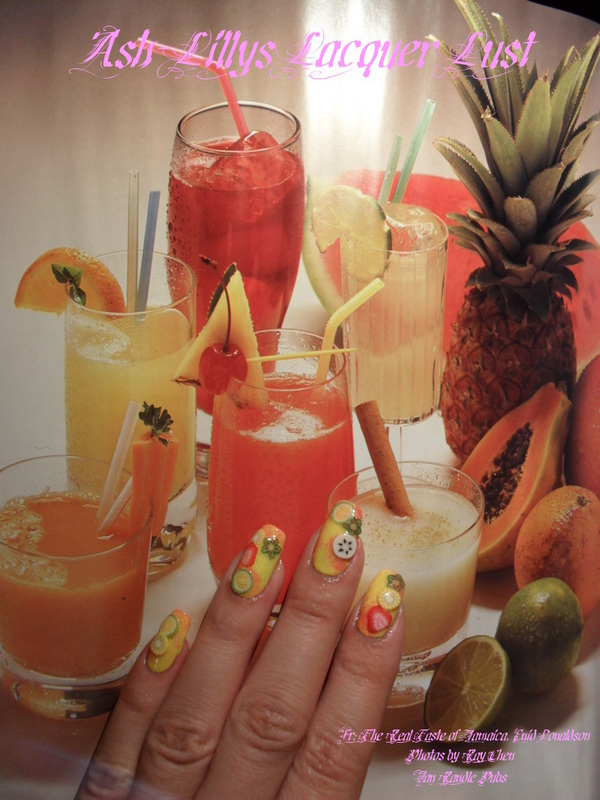 I hope this manicure put a smile on your face and made you forget the winter weather for a liddle while. Does the Rimmel polish smell? @Ann, yes, it does - it actually does smell of apricots. I've got a post of this polish somewhere in here, lol. This looks refreshing and yum. I love the sponging for texture, and I've never seen these particular fruits in fimo before (lots of lemons oranges and kiwi, but not these). Love it!